What: The scrappy electro-pop offspring of Death Cab For Cutie’s Benjamin Gibbard and DNTEL’s Jimmy Tamborello which, with a little help from a couple of Jennifers – Wood and Lewis – crafted an album that would template much of indie- and electro-pop for the next decade and beyond and find a special place in the hearts of a generation of indie kids everywhere. 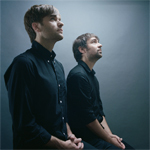 Why: After ten years of refusing to tour or record a second record, Gibbard and Tamborello have given up fighting it and in addition to releasing an extras-laden anniversary edition of Give Up, are also touring anywhere and everywhere. Who else: San Francsicans Mates Of State will open up and compound the cuteness of the evening. How: Tickets for the show are $49.50 to $59.50 in advance but courtesy of Collective Concerts, I’ve got one pair of passes to give away for the show. To enter, email me at contests AT chromewaves.net with “I want the Postal Service” in the subject line and your full name in the body, and have that in to me by midnight, May 26. What else: aux.tv has a retrospective feature that includes conversations with Tamborello and the Sub Pop rep who signed them and Metro also has a conversation with Tamborello. Never have I been more glad that someone has given up! Played a good set at Coachella this year.